You read that right, folks. 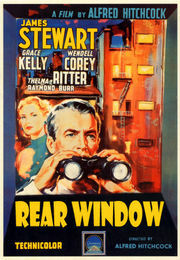 ‘Rear Window‘ , the Hitchcock classic will become a stage version on Broadway. Director Jay Russell and producer Charlie Lyons have teamed up with actor Tim Guinee (Homeland) to develop the project. Lyons and Russell have worked together before on ‘The Water Horse‘ and ‘Ladder 49‘. I’m not sure when production will start or when this will start its run, but I expect this one to be big. Now, if this becomes a success, will this be a pre-cursor to more Hitchock film to be adapted for the stage? Can you imagine a Broadway version of Psycho, The Birds, or North by Northwest? How killer would that be? This entry was posted on Wednesday, October 24th, 2012 at 10:19 am	and is filed under Film, News. You can follow any responses to this entry through the RSS 2.0 feed. You can skip to the end and leave a response. Pinging is currently not allowed. « Check Out the new TV Spot for ‘The Hobbit’!! !